On a recent weeknight, a multi-cultural group of people gathered around a table to discuss an issue that some have spent years addressing, and others are confronting for the first time: segregation. 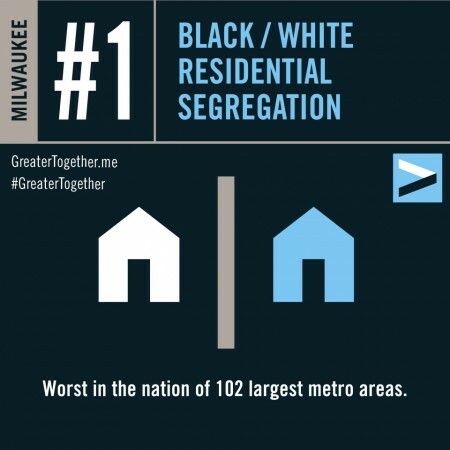 Attendees were members of the newly founded initiative Greater Together, which is focused on addressing what they consider Milwaukee’s most pressing issue, racial inequality. The coalition comprises local designers and activists from a variety of backgrounds. Hanson is the founder and former president of the American Institute of Graphic Arts (AIGA) chapter in Milwaukee. AIGA asked him to lead an effort that would commemorate the national organization’s 100th anniversary in a special way. “I said ‘what if instead of looking backward, we look forward, and we thought about what we’d like the power of design to accomplish,’” Hanson said. Inspired by recent stories by National Public Radio, the Huffington Post and the Milwaukee Journal Sentinel, Hanson decided to focus on segregation. But what started as a simple awareness campaign changed when NEWaukee Chief Idea Officer Jeremy Fojut pitched a competition for ideas designed to dismantle segregation, racial and economic inequality in greater Milwaukee. “What I want to see is long-term systemic change and innovative solutions that can be funded,” Fojut said. The Greater Together Challenge kicks off at a news conference July 15 at City Hall. Submissions are due Sept. 7 and the 10 finalists will be named Sept. 14. Finalists will present their ideas publicly in early October. The coalition is seeking sponsors to fund implementation of the winning project or projects. 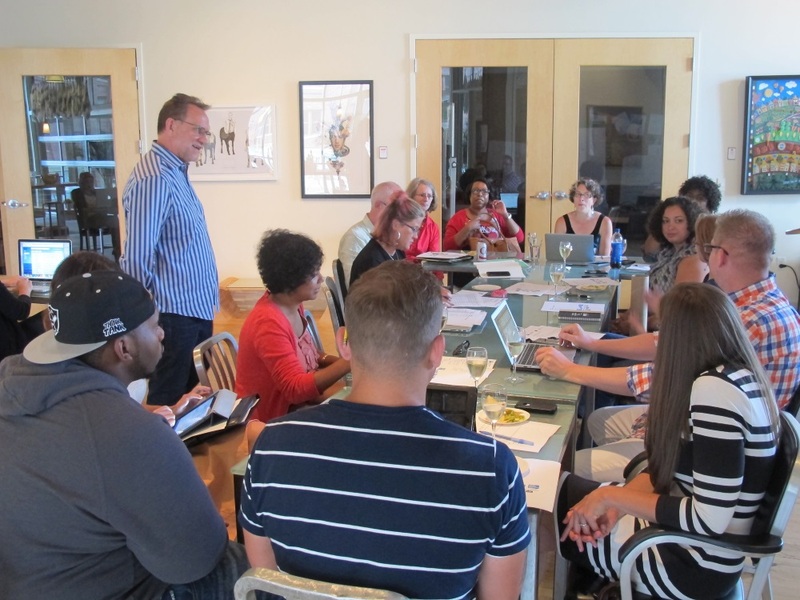 Fojut helped the coalition attract activist groups from around Milwaukee, such as the NAACP, ACLU, Milwaukee Teachers’ Education Association and Schools and Communities United. No one wants to see the project succeed more than NAACP Milwaukee communications chair Lashawndra Vernon. At the meeting, she challenged Hanson and the coalition to take concrete steps to dismantle segregation. Vernon said she wants to make sure the coalition is committed for the long haul. “At the core, I got involved because I’m really interested in making sure that race equity work dives deep,” she added. NAACP Milwaukee president James Hall, an early supporter of the initiative, views Greater Together as different than anti-segregation projects he has seen in the past. Hall said he is excited about the awareness the coalition is raising. Fojut said he believes in the group’s potential to make a long-term impact on the city. “You don’t solve this problem overnight. … You’re talking generational shifts.” But if the coalition can inch toward reducing segregation with stepping stones along the way, it can change perceptions, Fojut said. I have heard all of these fairy tales before. Form another leftwing group who will take a year to form, then ask for money from everyone, then will come up with some legisltive stupidity that will do nothing. How many have we seen in the last 50 years? Want to solve the problem, get some leaders to move like Barrett/Flynn/Chisholm, who would rather spend his time politicking against Walker and Kremer. Stop the crime wave. Fix the education system, bust it up. Ever since the Left, Unions and Feds got involved it has been destroyed. Kids cannot read so we lose them in 4th grade. You cannot build a city around basketball arenas but you can on crime free streets and good schools. Put the leadership there. When inner city kids can read, get good jobs these things will naturally take care of themselves. The free market will erase segregation? Is that your contention? Spoken like an old white male. Your posts are all so similar (attacking Barrett/Flynn/Chisholm, lamenting Milwaukee’s crime and schools), it’s like a computer program writes each one, not an actual human being. Do you have any original ideas at all? Well said WCD. The only way to fix MPS is to go back to neighborhood schools. But then I guess some would say that may promote more segregation. I would rather have MPS have 4 good schools; Bayview, Riverside, Bradley Tech, Hamilton (If neighborhood schooling was reinstated) and the rest failing than having all failing schools like they do right now (except maybe Rufus King). PMD, do you have any original ideas besides just attacking other posters? And then fixing MPS will completely erase segregation in Milwaukee? Is that the line you’re drawing? PMD, not saying that at all, maybe you would have benefitted from reading my entire post. I said that will probably increase segregation. I was simply responding to WCD about fixing the school system. Calm down chief. Justin…what is this bizzare idea that MPS has no well performing schools? Are you uninformed or purposely obtuse? Nicholas, you will also benefit from reading my entire post, I cited King as a good school. There really aren’t any other over achieving high schools, at all. I teach in MPS, I have for almost 20 years now. Trust me, the school system is in disarray (and that is no secret or “bizarre ” idea) and I am not the only MPS teacher in favor of returning to neighborhood schools. And Nicholas, those are under Top 25 schools in the state, not the nation. And where are schools like Custer, Washington, Vincent, and Marshall on that list? Or Bay View? Or Bradley Tech? I think everyone agrees we need to fix MPS, that improvements are needed. Hardly a radical or noteworthy idea. The idea that fixing MPS would quickly and easily solve Milwaukee’s segregation problem, I have my doubts. The worshiping at the alter of the free market gets a little absurd at times. Since when does attending your neighborhood school create better teachers? Since when did desegregation (or segregation for that matter) create better teachers? Since when did money create better teachers? I grew up on the South Side, went to Pulaski High in the 80’s and remember most folks saying Pulaski was a very dangerous high school in the city – everyone in my neighborhood went to private schools. I never once saw it as a dangerous school. We had the best music program in the city, most of the teachers were great, and like most of my peers, I graduated from college. Segregation will not force someone to be a good teacher. Money will not do it either – the parents’ involvement in their child’s education have failed miserably in the last few decades, and they have placed nearly all of the blame on either the teachers themselves, lack of money, or segregation issues. I am a Music Teacher now and I refuse to believe that everything but parental involvement is the reason for the decline of MPS – or any other public school system in this country. Just so I understand, when we say Milwaukee, we mean the City and suburbs right? Because our suburbs are 97%+ white -which cannot possibly be an accident. I’m also wondering if requiring kids to go to neighborhood schools would violate the integration laws of the 1970’s. I hope not because I am a firm believer in neighborhood schools. Also, neighborhood schools will help attract more families to the city. Bayview is a perfect example. I agree that better education and less crime would help to stabalize African American neighborhoods, but WCD needs to stop pointing fingers and blaming everything on the “lefties” or “libs”. That’s getting tired – time to use your brain WCD. Also, the history of segregation and it’s causes in this town is pretty is eye opening. The segregation of northern cities has it’s roots in discrimination. That is a fact. The history is horrific. To white people, which I am one, it’s about education and initiative. To black people its about about much more. So I think the conversation that taking place is good because it promotes goodwill and understanding, which has to happen before we can take the next step.